A few years back, a loveably zany Irish friend of mine lugged tea bags with her from her Drogheda cupboards to the communal hostel kitchens of Buenos Aires, Rio, La Paz and Cusco. I’ll admit that I didn’t really get it. (“If only I had brown bread right now too,” she’d sigh dreamily, nearby mate drinkers looking on curiously as she downed cup after cup of her smuggled vice.) To say that Edel is a tea enthusiast is an understatement. I didn’t understand her tea passion…that is, until I moved east to windswept Scotland, where a steaming cuppa is sometimes the only sure way to chase the chill from one’s bones. There I also learned to appreciate the soothing and intimate ritual of gathering with friends over a shared refreshment that requires time—time to steep, to cool, to sip, to savor, to merely pause and take it all in. Coffee culture seems the more visible beverage addiction in most US cities (DC included), while the army of tea devotees tend to fly under the radar. But I suspect they’re out there. So where can a tea lover get a fix here? The options include spots pretentious and proper, casual and cozy, and those somewhere in between. 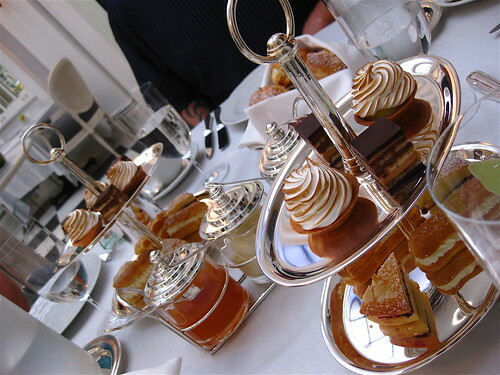 If you’re looking for a special treat, most high-end hotels in DC host afternoon teas. At M Street’s Park Hyatt, the Tea Cellar offers pots that range from $8 to $300 a pop (yes, you read that correctly). The cellar (attached to the hotel’s lounge and Blue Duck Tavern restaurant) stocks the biggest inventory of rare Pu-Erh in the US with vintages from 1949 to 2003. Guests choose between more than 50, single-estate teas like the “Vintage Pu-Erh Tea,” harvested from the ancient trees of Yunnan, China, and aged in caves like fine wines, and the “Reserve Tea”—extremely rare, hand-picked teas with a retail price of $150 to $850 per pound. The cellar’s early morning or evening guests “pair” teas with items from a light fare lounge menu. But afternoon tea goers on Saturday and Sunday (from 2:30 to 4:30 p.m.), find a marble table topped with pastries like caramel chocolate tarts and pumpkin pecan cranberry scones plus savory items like watercress/crème fraîche sandwiches to accompany flights of tea (who knew there was such a thing?). The Willard InterContinental has recently transformed its Peacock Alley into a Far East-themed oasis to launch the “Tea Chinois” program—timed in conjunction with National Geographic’s exhibit Terra Cotta Warriors: Guardians of China’s First Emperor. The narrow promenade has now become a Chinoiserie-inspired space with a decor of warm red tones, gold textiles, hanging silk lanterns, towering bamboo stalks, the light projection of Chinese “good luck” coins on the carpet and video footage of the terra cotta warriors on the ceiling. Guests enjoy calming background music played on the guzheng, a plucked string instrument in the zither family. The menu ($39 per person, $49 with a glass of Champagne) includes teas like English Breakfast Organic, Vanilla Bean, Rose Silver Needle (Bai Hao Yin Zhen) and African Amber and gourmet snacks like Chinese eggplant sandwiches and green tea meringues. Some claim tea at the Jefferson Hotel to be their favorite in DC, thanks to its “coolly elegant atmosphere” and freshly baked scones with clotted cream. For other luxurious sessions, check out afternoon teas at Connecticut Avenue’s Mayflower, The Ritz (with downtown and Virginia locations at Tysons Corner and Pentagon City), Strathmore Mansion and the National Cathedral (where a tour’s followed by tea and scones Tuesdays and Wednesdays at 1:30 p.m.). But if you’re not so keen to spend more money on a pot of tea and some finger sandwiches than you’d spend on a full-fledged night out on the town, Teaism offers a low-key alternative to the fine china and white tablecloth experience. (The eatery-shop’s tagline: “An alternative to the obfuscation, over-formalizaiton, and xenophobia of traditional Asian and English tea houses.”) With locations in Dupont Circle, Penn Quarter and Lafayette Square, Teaism provides moments of mid-city Zen as well as tasty dishes ranging from French toast and cilantro scrambled tofu to tea-cured salmon with naan and raita, “Asian gazpacho” and buffalo burgers on wheat focacia. Adams Morgan’s Tryst stocks an impressive array (that arrives in individual pots! ), to be enjoyed in a friendly, lounge setting. New gastropub Againn also serves tea in ornate pots imported from England. I’ll cheers to that! 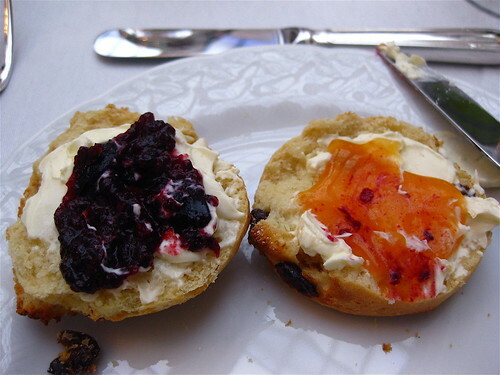 To add to your random pub quiz knowledge arsenal, learn the distinction between “high tea,” “afternoon tea” and “cream tea” in WLDC author Jenn’s recent post. Corinne has attempted to sate her wanderlust by living in Strasbourg, France, and Edinburgh, Scotland, and by embarking on extended jaunts to such far-flung spots as Australia and South America. But there’s something about her native Washington that keeps boomeranging her home between adventures. A writer, editor and photographer, she loves spreading the word on the lesser-known gems to be found in this vibrant, international capital. Check out some of her photos at www.ziptripfotos.blogspot.com as well as why she loves DC. My hotel destination is going to be the Tea Cellar since I’m a Puerh lover. Many different rare aged varieties? That would be just heavenly for me, especially since they’ll know how to prepare them too. I do love Hillwood and feel it is definitely a must-see for those who appreciate finery (as I’m sure many tea-goers do). However, their afternoon tea was just okay. I just remember the lemon curd not being very good. And the tea is held in a tent-like room and you get one of everything on a plate. Corinne has attempted to sate her wanderlust by living in Strasbourg, France, and Edinburgh, Scotland, and by embarking on extended jaunts to such far-flung spots as Australia and South America. But there's something about her native Washington that keeps boomeranging her home between adventures. A writer, editor and photographer, she loves spreading the word on the lesser-known gems to be found in this vibrant, international capital. Check out some of her photos at www.ziptripfotos.blogspot.com as well as why she loves DC.